AK Musik is proud to provide fun, energetic soundtracks for weddings, parties and other celebrations. We specialise in Asian, Indian and Bhangra music but can offer a fantastic blend of genres to give your event a unique sound. Our aim is to get your guests dancing and having the best time. When you choose us as your DJ we will do all we can to keep everybody entertained. With over a decade of experience we have all the skills to provide the best music for any sized wedding. We have access to a vast catalogue, including the latest chart hits and traditional style songs. Before the celebration we will get to know your theme, musical taste and plan for the night. This will help us to choose the right soundtrack for you. We prepare some of the playlist in advance but will also take requests on the night. As well as the music we can also provide lighting, decorations and a broad range of additional extras to give your venue the WOW factor. You can choose LED flooring, walls or curtains to add style to any venue. If you consult with us early we can even help you with your theme, including sourcing things like chair covers, centre pieces and traditional decorations. AK Musik is a really popular choice with people looking for a mobile Asian wedding DJ. We have built an amazing reputation and seek to further improve it with every event. Our profile has seen us play at celebrations across the UK and around the world. A personalised service is guaranteed every time you choose us. The story behind our success is a very simple one; we are passionate about music and always focus on helping guests to have a fun, entertaining time. We use the best equipment, including a specially selected sound system that sounds great in every venue. A selection of lighting is available so we can choose the right set up for your event. AK Musik offers several different packages so you can choose the right one to suit your wedding party. We can cater for any sized guest list, from as little as 250 people all the way to over 1500. With each package you can decide which added extras you want a get a fully customised service. 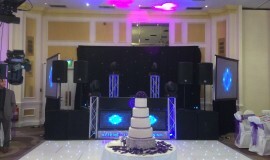 To find out more about hiring a professional mobile Asian wedding DJ please call 07985105182 and speak to us. We will discuss your event, go over the different options and provide a quote.